Today is a special day. It’s traditionally called Memorial day, but was once called Decoration day to honor the Union soldiers who had died in the Civil War. It’s a day to remember all the men and women who sacrificed in all wars to provide the freedom we all enjoy in the United States. Many of those soldiers gave the ultimate sacrifice, their very lives, so that we might be able to live in a free society. The older generations seem to understand the meaning of the day more than anyone. Makes sense, since they lived through more of the carnage than most. It is so important that we parents instill that appreciation in our kids. It’s good that a majority of younger parents haven't had to fight in a world war, but the respect and appreciation still needs to be passed on. I remember when Elizabeth and Eric were in elementary school, I read in the paper that the Branson V.F.W. post (veterans of foreign wars) was having a ceremony at the memorial at the local cemetery. So I loaded up the kids and a few of their friends and we went to the ceremony. The kids didn't really understand what was going on so I explained to them that it was a time to appreciate those that had fought in wars to keep bad people from bothering our country. They thought the gun salute was really cool (I did too). Take the time to tell your kids about the meaning of Memorial day- whether kids or teenagers, help them understand the true meaning of honoring heroes. I grew up in a military family. My dad was a Lieutenant Colonel in the Air Force. He was a physician and served in the military for 22 years. Up until 4th grade, our family moved every 2-4 years. My 3 older brothers lived all over the States and I was actually born in Wiesbaden, Germany where my dad was stationed at one of the largest bases in Europe. We grew up with a deep respect for the military. Living on the bases, we saw the day-to-day simple sacrifices that our father made while serving as a physician in uniform. Certainly, those that fought in major wars and gave their lives are deserving of our deep respect. But also those men and women who served in the military that did less glamorous things to preserve the freedom need to be respected also. Yes, today is a special day called Memorial Day. Have a blast on the lake and barbequing, but be sure and spend it with your family and be sure and discuss the true meaning of the day. Tell your kids a story about your parents or grandparents that served in the military (or about your service). 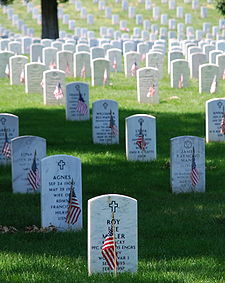 Maybe visit a military cemetery in your town to honor those that served and gave of themselves for us. Also, let’s not forget to honor the One who gave His very life so that we might live, Jesus Christ. Any true Memorial Day needs to pay homage to God’s wonderful plan to set us free for eternity. Teach that to your kids too. I agree Joey...one of the most important things you can do for your kids...love reading your stories!